Before amateur radio took over my life my main pastime was competing at dog agility which I did moderately successfully for many years, for several of those I was even the chairman of a Nottingham Agility Dog Training Club and organised one of the larger Kennel Club Championship shows as well as judging at many events. If you search my YouTube page there are a number of videos showing me and the dogs in action. Things change and sadly I became disillusioned with the sport as seemingly endless rule changes and its increasing popularity saw it losing its core ideal, what was meant to be fun for dog and handler had sadly become too competitive, professional and commercial, too many people now make money out of the sport and what was once an enjoyable social activity is now spoilt by unsportsmanlike behaviour, complaints and bitchiness. This is a lovely old-style small friendly show with the bonus of being held just a stones throw from the sand dunes and beach. I had agreed to go and like the recent holiday in Skye it was initially planned with no thought for any radio operating. We would be caravanning at the show for the best part of four days without any electrical hookup and the wife had volunteered to help on Saturday leaving me on my own for most of the day… so a plan was hatched at the last minute. I purchased a nice new ‘spare’ 100A/h leisure battery and smuggled on board the FT-857D with some suitable battery clips, headphones, a fiberglass pole, some antennas. I don’t own a suitable ‘portable’ ATU at present, having borrowed one from SKARS on several occasions but as this was a last minute thing I would have to chance operating without it. I took the M0CVO HW-20P OCF-Dipole, which has a usable VSWR on 20m, 17m, 15m, 12m and 10m without an antenna tuner and the M0CVO Magitenna, but wasn’t sure what I would get from this as I’d only ever used it with a ATU. The weather was difficult all weekend, we arrived on the Friday to be met with warm and sunny conditions but a steady strong wind. There was bit of a battle to get the caravan awning up but we managed it.Saturday the wind just got stronger, the forecast for Sunday was for even stronger winds so it was dismantled and packed away, indeed it was worse around 25-30mph with must stronger gusts. Undeterred I got the antennas up, however the fiberglass pole I have must be getting on for 10 years old, and would often fly a pirate flag when camped at agility shows. It had already lost it’s top section many moons ago but was still quite tall and so I hoisted up the OCFD balun and coax and the end of the magitenna wire in the buffeting wind and it was swinging around wildly – almost inevitably it proved too much and the remaining top section splintered! Despite losing over in a metre in length I tried again and managed to get everything up, the OCFD wires were tied out to form a sort of inverted-vee using a handy nearby fence, the Magintenna was pulled to form a sloper across over the front of the caravan, but due to the lost height actually touched the front of the roof. Amazingly I got an almost 1:1 VSWR on 40m and loud and clear RX. This weekend was the International Lighthouse and Lightship Weekend (ILLW) this annual event has been going since 1995 and promote public awareness of lighthouses and lightships and their need for preservation and restoration, and at the same time to promote amateur radio and to foster International goodwill. The bands were kind and I had an enjoyable Saturday afternoon and a few hours on Sunday making QSOs with a number of UK and European lighthouse stations on 40m and 20m and it seems the whole event was a great success. Alas the wind proved too much for the remainder of the fiberglass pole and it developed a large crack in the bottom section forcing me off the air. By coincidence Haverigg has two lights, the old Hodbarrow beacon and the restored Hodbarrow Point lighthouse (pictured above from the beach). Last year we walked to the restored lighthouse but since the restoration was completed in 2004 it is sadly looking in need of some remedial work. I only learned of the ILLW event at the last minute and sadly neither of the Haverigg lights were activated that weekend, next year if the show is on at the same time I may look at trying to operate from them. Oh and the wind? Here is a video of a walk on the beach on the Sunday morning.. In the film “Willy Wonka and the Chocolate Factory” there is a scene where the lucky children (and parents) enter the “Land of Candy” where everything is edible and they run around grabbing a taste of everything. I am beginning to know how they felt. Amateur radio has so many different things to try and over the last year I have found myself jumping around having a dabble at new things. Doing this and time being scarce has inevitably impacted the HAB payload and other Arduino projects. I have also neglected some of my previous satellite monitoring activities. I had been regularly decoding the FUNCube-1 (AO-73) telemetry and uploading packets to the data warehouse (see earlier posts). To do this I had been using a discone in the loft and a FUNCube Dongle on the ageing main computer in the house. Of late there have been a large number of new satellites launched including the UKube-1 and the QB50 satellites which have modules and transponders as part of the FUNCube project. Looking at the FC1 upload ranking list I saw I had dropped down significantly and decided it wasn’t acceptable! As part of my antenna upgrade I have put up the X-50 dual-band collinear on the top of the pole feed with nice low loss RG213. 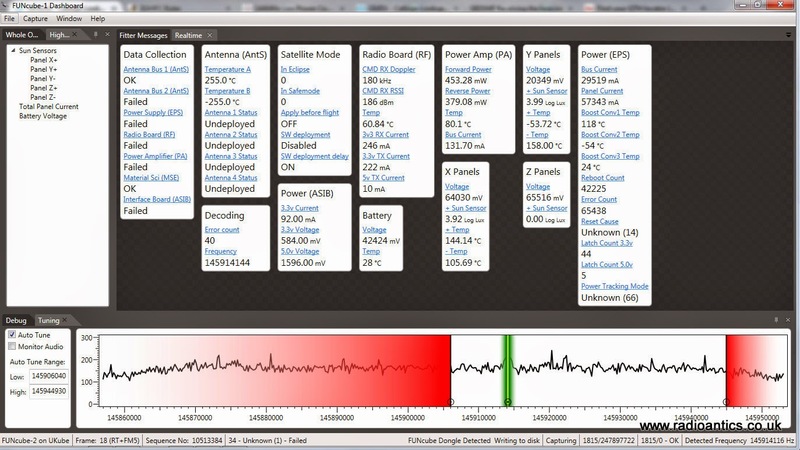 This is currently connected to the FUNCube Dongle Pro+ dongle on the shack laptop, with the latest dashboard software installed. It has been running 24/7 for the majority of the last week and has captured close to 2000 telemetry packets from FC1 a significant performance increase compared to my earlier set up, and I have now surpassed the 10,000 packet milestone (currently 11,626). 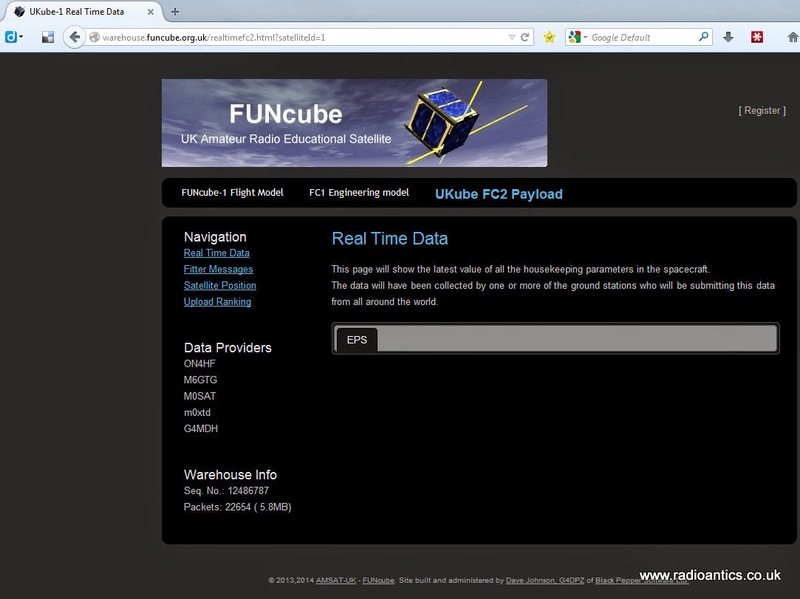 I have also uploaded over 500 telemetry messages received from the FUNCube-2 on UKube-1. I have actually received more but a fault in the warehouse meant a lot were rejected due to a incorrect data field. The FC2 subsystem on UKUBE-1 may not be enabled on every pass while the satellite is commissioned and the FUNCube team will be releasing an updated dashboard shortly for when it is operating full time. On one pass yesterday I thought I would capture some screen shots and show how I’ve got the dashboard set up for both payloads. 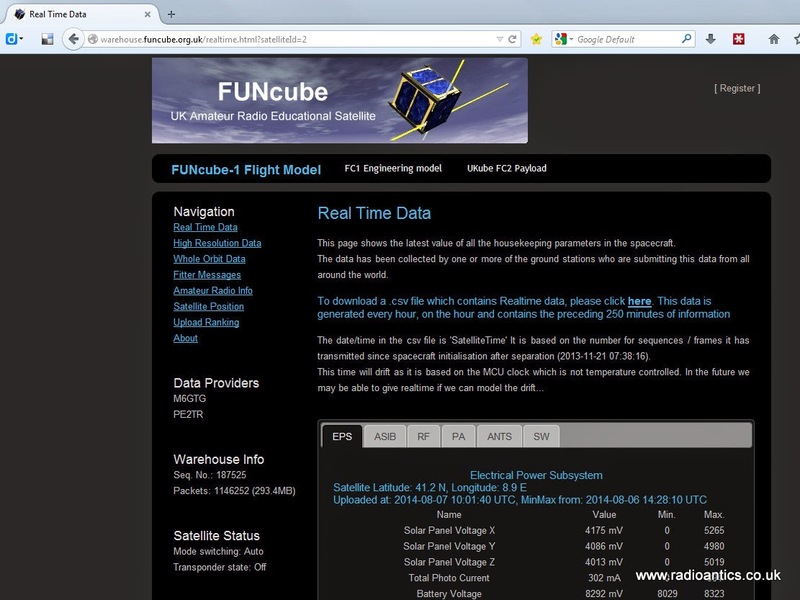 As already mentioned the existing dashboard can be used to receive both FUNCube-1 and 2, if using the FUNCube Dongle Pro+ by setting the central frequency to 145.905MHz and adjusting the upper and lower filter curtains both payloads can be received. 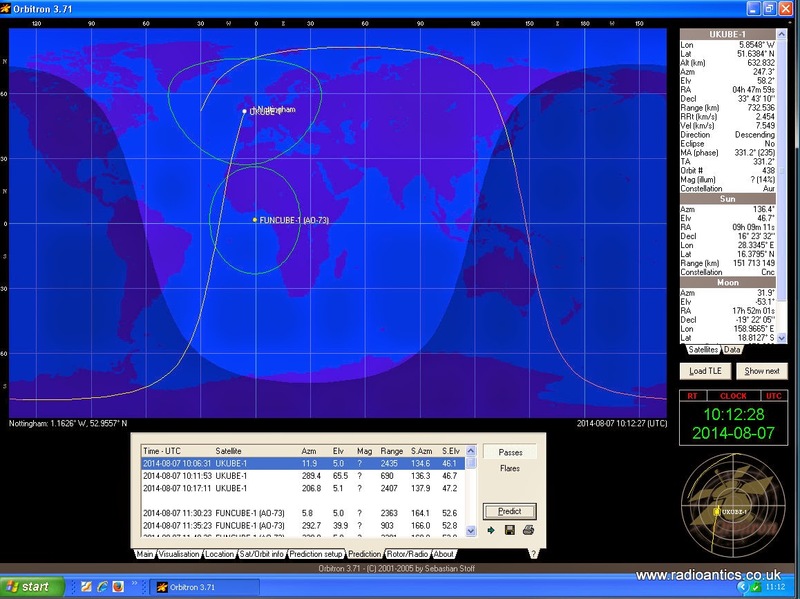 On the Orbitron prediction software you can see FC1 is overhead, with UKube-1 over the North pole. The reception window on the dashboard is limited by moving the curtains. I have the lower one set at 145.906MHz just enough to filter out the centre SDR spike, the upper one is at 145.945MHz. The telemetry signal on FC1 is at 145.935MHz but due to the Doppler effect the received frequency will vary above and below this nominal value, 10kHz either size is sufficient to compensate. If you were just interested in one satellite you would move the lower curtain to around 10kHz below the nominal download frequency. 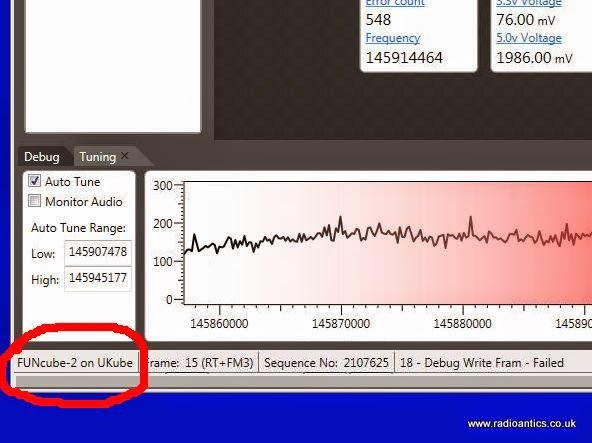 However since UKube-1 is on 145.918MHz the lower curtain is set to below this again to compensate for the Doppler shift. The resulting receive window will allow both to be received. However this does risks problems should QRM occur in the pass band as the decoder can lock on to this, luckily the improved dashboard software discriminates between the signal and noise much better than previous versions. The data is being uploaded and checking the real time display on the warehouse confirms this (my old callsign M6GTG) however you might not show up every single time and the FUNCube-1 Flight Model tab must be chosen as seen below. As the pass finishes and UKube-1/FC2 comes overhead and due to the omni-directional X-50 I don’t need to change anything. The dashboard soon detects the new signal at the lower frequency and begins decoding. 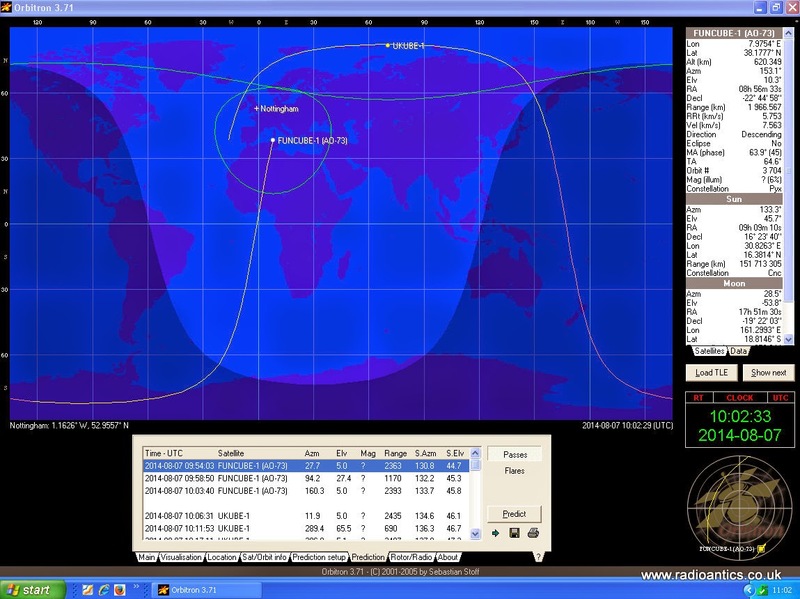 Again the upload can be confirmed by viewing the real time data page on the warehouse by selecting the UKube-1 FC2 Payload tab. It should be noted that it seems FC2 is sometime sending spurious data elements in the telemetry which the warehouse is rejecting so some uploads may not be displayed. As I posted at the end of June I was almost on the point of giving up on HF due to the high levels of QRN/M suffered at home. In desperation I had been looking at some of the noise cancellers available from MFJ and others. I had heard conflicting options on their effectiveness but was willing to try one if I could obtain one cheaply. The MFJ units are in my opinion expensive to purchase new so I bid on several that came up second hand on eBay but they invariably also went for silly money. I was even contemplating building an home-brew one from the numerous designs available. Then I discovered the WiMo QRM Eliminator, made by the German company WiMo Antennas and Electronics. Several online reviews and numerous YouTube videos seemed to indicate its effectiveness and taking up the then summer discount offer I ordered one for the princely sum of €147 including postage, around £116. Due to heavy demand and low stock levels following the International Ham Radio Exhibition at Friedrichshafen I was told the unit wouldn’t be available till the middle of August, so I was pleasantly surprised when the unit turned up last Friday morning. I have connected it up and briefly tried it out and am impressed, as this video illustrates. Even using one for a short time I would agree that they are something of a black art to set up and use and can understand why people might consider them useless, but this may be due to lack of understanding of how they work. I have created a diagram showing a typical scenario. 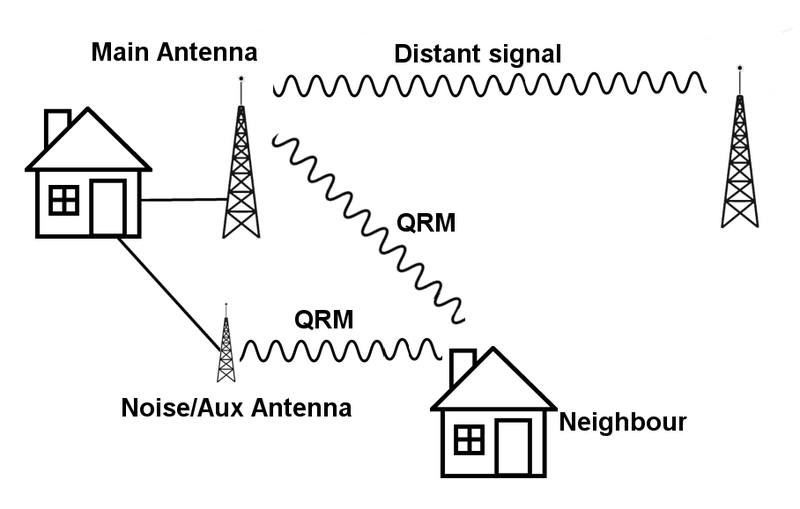 The operators main antenna is designed to pick up distant signals, not necessarily DX but signals not emanating from the immediate vicinity, however they will also pick up locally produced QRM as shown, perhaps generated by a neighbours TV or PLT device. The QRM eliminator has a second antenna which isn’t as efficient as the main antenna and ideally just receives the local QRM at a similar level to the main antenna. The device then takes this second signal and inverts the phase so when it is mixed with the main antenna signal the QRM is cancelled out. 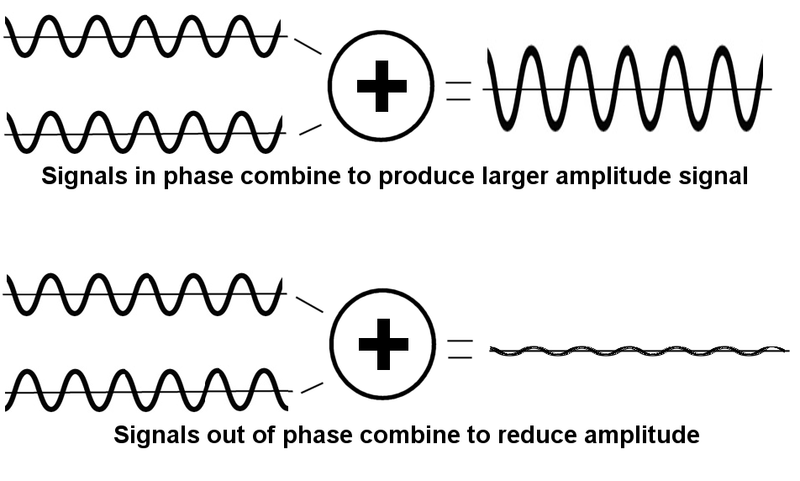 The principal is quite simple, if you take two in phase signals and combine them you will end up with a signal with a larger amplitude. However if the signal is 180 degrees out of phase, the positive and negatives of the waveform cancel each other, producing a null signal. The tricky part is making sure the noise antenna just picks up the noise, if it picks up the main signal then that will also be cancelled out. The WiMo unit has three controls a gain and two phase controls it is a case of altering all three to maximise the cancelling effect without losing the main signal. At present I just have several meters of wire running as the noise antenna along the side of the shack and this seems to fairly effective. The unit is powered from 12V and can be left in line, but requires the PTT/TX-GND signal from the CAT/Linear socket from the transceiver to activate a bypass when transmitting and I don’t have the appropriate 8-pin plug at present. If the unit is powered off the bypass is automatically engaged. All in all, first impressions are good and looks like a worthwhile purchase.